The Loker Reading Room in Widener Library reopened on Saturday after undergoing renovations. The penultimate stage of Widener Library construction over the past five years was completed this weekend, opening the second floor reading room and reference services. Before this phase of construction began about a year ago, Widener had one main reading room space. As of Saturday, there are four main reading rooms, the focal point of which is Loker reading room, which formerly housed both study space and reference desks. 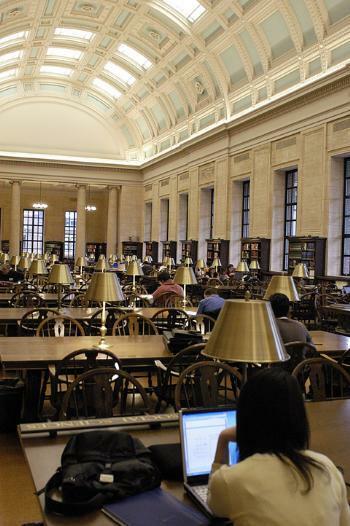 “The most important thing about the second floor is that it really illustrates how we reorganized the spaces in the library,” said Beth Brainard, director of communications for Harvard College Library. The old catalogue room will now house the references services with new Hollis terminals and a reference desk with reference librarians. New furniture for the second floor has been delivered into these new reading rooms giving the space a very polished look. The reference services area, prior to the completion of construction, was temporarily located in the Rotunda. With the reference area finding a new home, the Rotunda, along with the Harry Elkins Widener Memorial Room and the Stacks Reading room on the Memorial room level are now closed. Over the next few months additional changes will be made in these two rooms to finish off the Widener project. The collection of rare books has already been moved to Houghton Library, and additional projects—such as refinishing furniture and floors as well as repairing plaster and installing a new security system. The cases that hold the Harry Elkins Widener collection are being modified so they have the same temperature and humidity as the other stacks in Widener. “They will be in an atmosphere that will significantly lengthen [the collection’s] life span,” Brainard said. The large construction fence that had been up at the West Door has also been removed and over the next few months, crews will reinstall the light pole, replant a new tree and regrow grass, all in preparation for June’s commencement activities. “Its cool to finally see the people sitting on the steps and on the side of the building,” Boyer said.